How can Montpelier have healthier homes? In what ways can we use federal money to improve housing? Will Montpelier become a growth center? What does that mean? What are the latest housing market trends? What should happen to old school buildings? What ideas do you have for the future of housing in Montpelier? Join the envision Montpelier Stakeholders for a town meeting about housing. enVision Montpelier seeks to include the voice of every individual in the Montpelier area to create a long-term community vision and action plan for the next 30 to 100 years. It’s nearly the time of year when CVRPC mails out the request to town clerks to update our mailing list of local officials such as planning commissioners, select people, zoning administrators, and the like. However, I will wait until after Town Meeting to mail my request. I just want to alert you that it will be forthcoming! In addition, I will be preparing the annual survey of housing units permitted during 2008. I will glean most of this data from town reports, but if CVPRC doesn’t receive a copy of your town report,then I will have to send you an e-mail requesting the data. We would appreciate receiving a copy of your town report because it provides us with invaluable information on each town, AND saves us all an e-mail or two! Please send us your town reports, and have a good Town Meeting! Purpose: This regional energy network meeting is the 3rd in a series designed to provide an opportunity for representatives from local town energy committees, town energy coordinators, and other interested individuals to discuss local and regional efforts to promote energy efficiency and renewable energy. This meeting will focus on what communities can do to promote alternative and public transportation featuring speakers from VTrans, 10% Challenge, and the Green Mountain Transit Agency. Snacks and beverages will be provided. Discussion: How can “Go Vermont” help you promote alternatives and public transit in your community? Discussion: How can communities work together to build a regional approach to “Way-to-Go” this coming Spring? Discussion: What is the process for increasing public transit routes and how can communities/public get involved in that process? What options are available to promote bicycling and pedestrian pathways and usage at the local level? CVRPC for many years now has been assisting our municipalities in the inventorying of bridges and culverts along the town highway system. The data that CVRPC has collected can now be easily accessed by using the Vermont Online Bridge and Culvert Inventory Tool (VOBCIT). This web based tool was developed in cooperation with VTrans and the RPC’s under the guidance of Act 164 Sec. 61. Below is a condition summary report of our efforts to date. 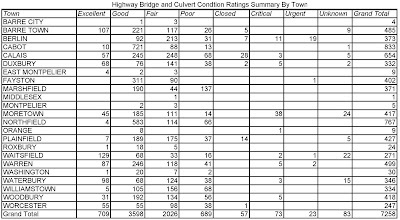 The table shows that the vast majority of the culverts inventoried have a condition of excellent, good, or fair. While these results are encouraging, CVRPC is by no means finished with the data. We still have a number of towns whose data needs to be loaded into VOBCIT, as well as continuing to update the bridge and culvert data already loaded into VOBCIT. http://apps.vtrans.vermont.gov/BridgeAndCulvert/Login.aspx?ReturnUrl=/BridgeAndCulvert/Default.aspx The username and password can be found at the bottom of the web page. Application deadline for the Hazard Mitigation Grant Program (HMGP) is March 31, 2009. The application form can be downloaded from VEM’s website at: www.dps.state.vt.us/vem To download the application, please go to the Mitigation tab on the left side of the website, and then to Mitigation forms. By now, most of you should be well on your way in completing the application. Be advised that a successful HMGP grant application requires a significant amount of time and effort; please do not wait until a week before the deadline before starting work on your application. Applications must be completed in full and must include an engineering study/design, appropriate maps and the FEMA required benefit-cost analysis (BCA). VEM is available to provide assistance in completing the BCA requirement; feel free to contact Ray Doherty to set up an appointment to do the benefit-cost portion of your application. FEMA will not fund a proposal unless a BCA has been completed with a benefit-cost ratio of 1.0 or greater. Towns without a FEMA-approved Pre Diaster Mitigation Plans are not eligible to apply. The Vermont Community Climate Change grant program supports projects that increase energy efficiency, achieve measurable reductions in greenhouse gas emissions, and increase ue of clean, renewable resources. Municipalities and non-profit organizations are eligible applicants. Grant awards require a 10% match, are maxed at $12,000 per project, and $360,000 is available statewide for this round. The application deadline is April 1, 2009. Each applicant is eligible for only one grant award per year, and grants are awarded on a competitive basis. For more information and the eligibility criteria, go to www.anr.state.vt.us/air/Planning/htm/ClimateChange.htm. Congratulations to three of our communities for being awarded a municipal planning grant this round despite the fact that the funding for these grants was cut by 50%. Barre City received $15,000 to work on creating new parking, circulation, and other use plans for the underused Merchants Row area; Plainfield received $7,500 to assist with creating a new municipal plan based on new surveys and outreach; and Waitsfield received $15,000 to update their municipal plan, analyze the socio-economic and transportation data, and coordinate extensive public outreach. Because of the funding rescission, these were the only grants awarded in the Central Vermont region. Nice work, everyone!